At the G20 Summit last week in Cannes, Nicolas Sarkozy held only four private meetings. One was with Barack Obama and a second was with Manmohan Singh, prime minister of India. (It’s not clear whether Felipe Calderon, the president of Mexico, met alone with the French president or whether his country was a fully deserved separate topic on the agenda, perhaps as a “disaster in the process.”) The other two privileged to have Sarkozy alone face-to-face were Hu Jintao, president of the People’s Republic of China, and William Gates, co-chair of the Bill and Melinda Gates Foundation, literally the only people in attendance representing enterprises that are financially solvent. Take a look at these primarily optimistic documents and try to assess the honesty of the reports. Actually, this is the measure of our politics: deception, self-deception, duplicity, hypocrisy, pretense. It was at this jamboree of whoppers that Sarkozy chose to confide to President Obama that he “can’t stand Netanyahu anymore. He is a liar.” And the president responded, sort of in kind: “You’re fed up with him. But I have to deal with him every day.” Of course, this was one of those moments that journalists dream about. The microphone was on when it was supposed to be off. 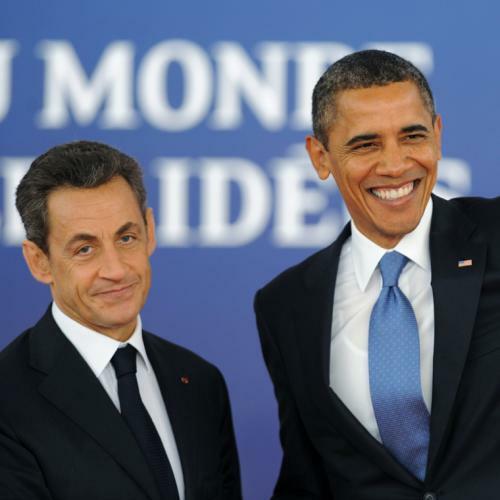 Now, Sarkozy is not exactly known for his verisimilitude and neither is Obama, whose foreign policy, in particular, is based on the silliest improvisations of history. He has certainly made up his narratives on Muslim culture, in general, and on American-Arab relations, in particular. This accumulated flim-flam has made U.S. policy in the orbit of the crescent a laughing-stock for, well, everyone. But Sarkozy’s prevarications are closer to fibs, although they arise from deep within his character. Just a few days ago the London Daily Mail detailed his pathetic attempts to make himself appear taller than his 5’5”, four inches less than the first lady, Carla Bruni. The official entourage of the president of the Fifth Republic carries around a variety of height falsifiers, platforms for every situation and every need. He cannot speak without a riser that buoys him almost aloft. Even Napoleon, actually two inches shorter, was not that vain. So Sarkozy has risen, so to speak, to new heights in his deceptions. He is also full of portent in other aspects of his public life. You can find lurid reports all over the media on how Sarkozy had the French exchequer refurbish an $82 million Airbus 330 at a cost of $410 million. Which allowed $110,000 (!) for a double oven (to bake baguettes just like le president gets at the Élysée Palace). Presumably, the craft also has a crib for Carla and Nicolas’s newborn baby. But it is definitely equipped with two separate showers, one for the man and the other for his spouse. When you read about the rich tastes of this presidential couple you realize that Michelle Obama is actually a skinflint with our dollars. I am actually happy that Sarkozy let slip his dislike for Bibi Netanyahu. It will put a crimp in his cynical jumping from one side to another on “the question of Palestine.” France voted for the admission of Palestine to membership in UNESCO. So what! UNESCO is composed of nearly 200 member-states, gives out dozens and dozens of prizes, has dozens and dozens of offices, certifies dozens and dozens of “world heritage sites,” and spends hundreds and hundreds of millions of dollars, minus the $60-odd million that the U.S. withdrew last month and the further cash that Canada will not donate. Other states will try to get out of their commitments, too, and this will harm the world not at all. If you don’t believe me read the document labeled on the web as Programme & Budget (C5). The truth is that the Palestinian “government” (aren’t there actually two Palestinian governments?) belongs in UNESCO because the organization is composed of paper programs. The aforementioned document includes a detailed roughly three quarters of a billion dollar budget. Here’s an instance of how they use the language: “Biennial Sectorial Priority 2: Advocating the inclusion of culture and intercultural dialogue in development policies to foster a culture of peace and non-violence.” Then there’s a 50-page addendum dealing with the “expected results at the end of the biennium.” So the Palestinian fantasy and the UNESCO fantasy mesh. The Security Council will not behave as it was expected to on Palestinian membership in the U.N. itself. And Israel and my Zionist comrades should give credit where credit is due, that is, credit to President Obama who may finally have grasped—I’m not really sure of this—that the Palestinian Authority is not ready to govern because the political culture of the Palestinians is not yet governable. All the hosannas to Salam Fayyad notwithstanding. If Obama has in some way internalized this it is great progress. Still, the president remains fixed on the matter of housing in Jerusalem. Let me try to explain this to my readers. The Arabs have held up history for at least 65 years. Bobby Kennedy (who was assassinated by a Palestinian terrorist, if you recall) recognized this on his visit to British Mandate Palestine a month before Jewish independence was proclaimed. Arab statesdeclared war on the nascent commonwealth and lost. However, the army of Jordan captured and annexed what was supposed to be Arab Palestine and also old Jerusalem including the ancient Jewish Quarter which, according to the Partition Plan, was to be a part of an internationalized city. With great remorse, the Jewish Agency for Palestine, the interim Zionist government, had accepted this heart-rending provision. But from 1948 to 1967 Israel was actually separated from the very heart of Zion. When Jordan joined Egypt and Syria in what became known as the Six Day War but lost, it surrendered the West Bank, including the Arab sections of Jerusalem and also the places, sacred and quotidian, of Jewish history. Since big power pressure had never been mustered to fulfill the Jerusalem internationalization provisions of the Partition Plan, Israel immediately began to repopulate the Jewish quarter and to build Jewish communities here and there in the new city. And the Arabs continued their war. Gilo is one of those communities, started in 1973, not incidentally in east Jerusalem but in the southern part of the city and on Jewish-owned land. Stupidly, the administration has stridently objected to new housing even in this area. What the administration and the Quartet are doing is to permit the recalcitrant Palestinians to impede the natural development of Jerusalem. Similarly, Obama goes apoplectic every time a few hundred apartments are built in areas of the West Bank adjacent or very close to the Partition Plan lines. Everybody knows deep down that Israel will never give over to Palestinians the choke points around city. I have my own intuitions about the resignation of Dennis Ross as the president’s chief adviser on the conflict. He could not have been happy during the time when Obama was fantasizing about the intentions of the Arabs, in general, and of the Palestinians, in particular. Of course, it’s not as if his dealings with Israel were always smooth sailing either. He also had to tolerate the insistent stupidity of George Mitchell who couldn’t rid himself of the notion that Palestine was Ireland. Ross has been on this Palestine case for decades. It will not be solved now. Ross is rejoining the Washington Institute for Near East Policy, a think tank that has few illusions. Netanyahu is not the problem. The problem is that the Palestinians want to reverse history. And they can’t. More than that, their Arab brothers and sisters are otherwise engaged. My guess is that Arab Winter is fast approaching. Martin Peretz is editor-in-chief emeritus of The New Republic.